The Death of International Development? I have a joke – it’s not a very good one – that in ten years’ time new staff joining my development studies department will have to don the equivalent of the Hogwarts sorting hat. This will allocate them to either Somalia, Chad, DRC or Afghanistan, which by then will be the only developing countries left. 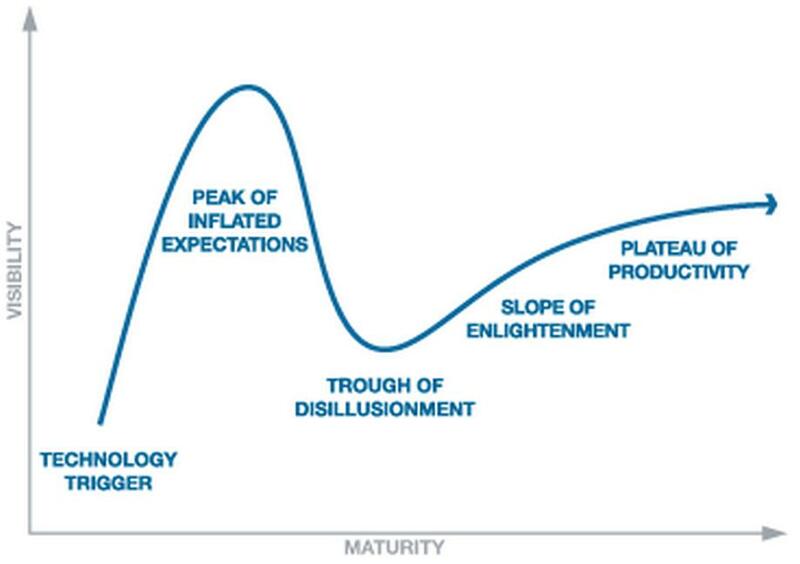 Sadly, this will probably be an exaggeration but there is a sense in which the development industry is succeeding, and thus steadily putting itself out of business. Take a look at the ‘five good things’ tab by Hans Rosling at: http://www.bbc.co.uk/news/magazine-24835822; or take a look at the changes in the DAC list of aid recipients: the number of low-income countries on the list shrank from 72 in 1997/99 to 54 in 2012/13. So we have an external, objective reality of fewer developing countries over time. We have some evidence of shrinkage within development discourse: comparing top-10 tag clouds for the MDGs vs. the post-2015 agenda, it is notable that “developing countries” no longer appears. And we may also have an internal, subjective reality. There must be better data on this – please comment to supply – but I was struck by an anecdotal report from a colleague who has travelled to a number of African countries in the past few months. She found the young Africans she met were unwilling to accept the “developing country” label for their nations, which they saw as stigmatising. They saw the development industry typically focusing on the negative, and missing out on enterprise, innovation, investment, opportunity and other related keyword identities. In part, this data just reinforces past messages on development becoming a more intra- than inter-country phenomenon e.g. that the majority of the world’s poor live in middle-income countries, and may well continue to do so in coming decades. So we see a decline of the national, geographic identity of development both externally and internally: perhaps a better title would have been “the death of the developing country”. But we also see signs – in Rosling’s presentation but more generally in progress on the MDGs – of fewer individuals overall suffering at the wrong end of the socio-economic development continuum. While much of this is contested and could be reversed, the direction of travel at present seems clear and it will have important implications. First, for the notion of international development. One can see this reflected in the changes from the MDGs to the post-2015 agenda, as discussed in a number of prior blog entries. While mainstream notions of economic development and social development remain; they now sit alongside other views: sustainable development, inclusive development, open development, institutional development. The development hegemony of the global North is also being challenged by Southern models of development. In other words we have an increasingly pluralistic notion of development which must bring with it niches and fragmentation in the field. In turn, these could well bring a lack of focus and lower profile for international development. Second, for development studies departments. Do they shrink themselves down alongside the shrinking of low-income countries? Do they convert themselves into area studies departments? Do they convert themselves into more cross-cutting departments that focus on global challenges: poverty, environment, inequality? Do they embrace the intersections with business schools and expand to encompass the “emerging economy” notion? Linked to all these possibilities is again the question of identity: how do development studies departments brand themselves externally, and think of themselves internally to match the changing development context? 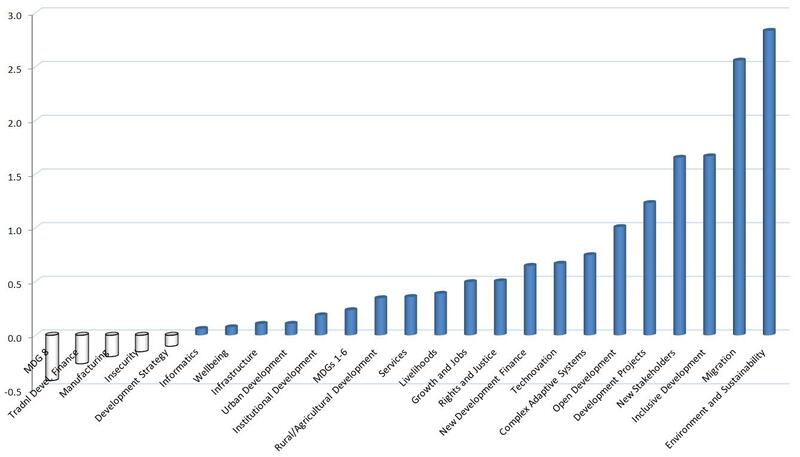 I’ll leave aside the discussion about the extent to which the development industry is the cause of the improvements Rosling and the DAC list describe. In two earlier posts, I outlined the current process of creating the post-2015 development agenda, and analysed how important it will be to development practice and research. 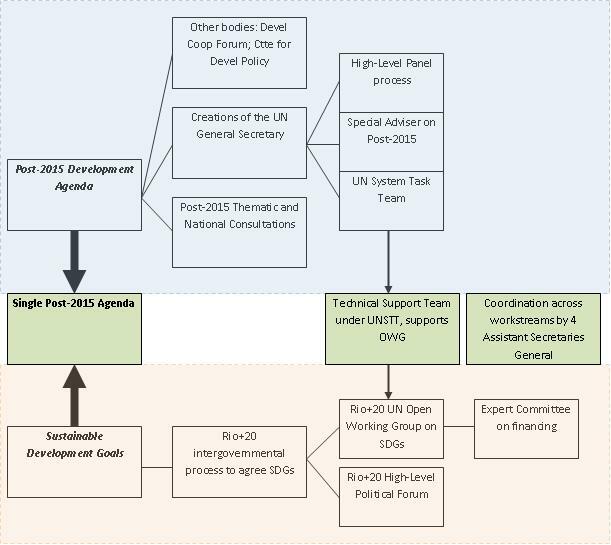 The foundational “Realizing the Future We Want for All” document and its update “A Renewed Global Partnership for Development”: these are the products in 2012 and 2013 respectively of the UN System Task Team; the core of the post-2015 process. As part of that process a High-Level Panel was set up based around the leaders of the UK, Indonesia and Liberia, which produced a report, “A New Global Partnership” in mid-2013. The Open Working Group, and High-Level Political Forum, and Expert Committee associated with Rio+20 and the Sustainable Development Goals are all in mid-process, so the best guide as yet is the outcome of the Rio+20 conference; a UN General Assembly resolution of 2012 entitled, “The Future We Want”. Textual analysis of these documents was undertaken. A simple approach to this was the creation of tag clouds: the cloud for the combined post-2015 documentation is in the figure below. c) cross-checking with terms used in a set of other current development reports and journal paper titles. The frequency of all terms was normed to a mean count per 10,000 words. All meaningful terms which appeared more than 10 times per 10,000 words (i.e. 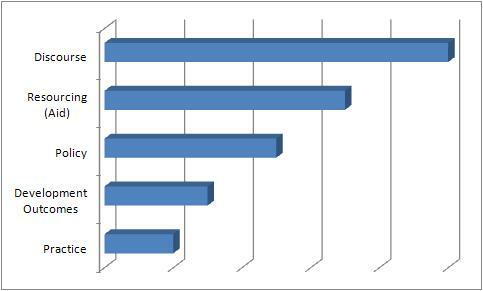 with a frequency of more than 0.1% of the text) are shown in the table below. The importance of sustainable development as a core model, of course arising particularly because of the presence of the Rio+20 track within the post-2015 process; with some recognition of the role of inclusive development. Poverty and environment being the two most important individual development issues on the agenda. Perhaps, a reasonable parity between three of the main domains of development: environmental, social, and economic. But a question mark over the place for political development: “politic*” scores just 8.3 and so does not appear; but “govern*” would score 31.2. A strong presence for items related to MDGs 1 to 6: e.g. poverty, health, women, food, education. A strong recognition of the importance of technology within development. A strong presence for what one might term the mechanisms or processes of development: the need for partnerships and cooperation and participation, the role of policies, but also of processes and implementation and impact. Despite moves towards a more multi-stakeholder perspective on development and the presence of business and communities; still a dominant role for the state in its various guises: state, government, public sector. Some sense of a systems perspective on development. Maslow’s shade – or at least the importance of basic needs – stands over the agenda given the presence of poverty, health, food, energy, water, security. The recognised importance of data (just outside the list at 9.2) and information as the foundation for decision-making and action in development. Readers are encouraged to make their own analysis of the findings presented in the table, and to draw any other big picture conclusions. The following represents a first attempt at a “league table” for development studies journals. – Selection was on the basis of development studies journals that appear in various other tables or lists. However, development economics journals (inc. Economic Development and Cultural Change, Journal of Development Economics, Review of Development Economics, and The Developing Economies) were not included. If you have suggestions for additions (or deletions), then let me know. – Citation score is calculated by taking papers published in each journal in 2008 and identifying how many times each paper is cited in Google Scholar. The average number of cites per paper was then divided by the average number of years since publication. Very roughly, then, the score equates to average number of GS citations per paper per year. – One anomalous paper, with over 10 times the citations of any other (a pattern not seen in any other journal), was omitted from African Development Review. Had this been included, ADR would place seventh. – This exercise will be repeated and expanded in future years. What is presented here should only be seen as a first, fairly rough-and-ready set of figures. The original data used for the calculations can be found here. – The raw figures shown here should not be compared with the impact factor scores under Planning and Development provided in ISI’s Journal Citation Reports. The rankings can be compared. – Different disciplines have different citation habits and norms. Specifically, if economists cite more highly, then those development studies journals that include a greater proportion of development economics papers may gain a greater overall citation score. – Conversely – and requiring further investigation – in compiling the figures, I got some sense that papers in special issues tend to receive fewer citations. Journals that have a lot of special issues may receive a lower overall citation score. – The figures suggest that, beyond the obvious top two of JDS and World Development, there may be some mismatch between previous subjective ratings and actual impact. For example, Oxford Development Studies and Development Policy Review rank 3rd and 4th here, yet are unrated by most other journal rating schemes. – There is a moderate mismatch with the ISI JCR 2008 impact factor ranking. Most notably, four of the top ten journals here do not appear at all in the ISI list including the two top-cited ICT-for-development journals. – The table below gives details of other ranking and rating data on development studies and some development economics journals.